The Obama administration is reported to be pressing key members of the U.S. Congress to allow more time before taking final action on legislation that would impose tough, unilateral sanctions on Iran. The president says he believes there can be success within weeks, rather than months, in building a tough sanctions resolution in the U.N. Security Council. In discussing sanctions, President Barack Obama and administration officials have voiced optimism about achieving an agreement at the U.N. in response to Iran's ongoing uranium enrichment program, which Tehran insists is for peaceful purposes rather than for nuclear weapons. In a joint White House news conference last month with French President Nicolas Sarkozy, Mr. Obama said the door remains open to Iran, which he said understands what the terms of a diplomatic solution would be. But the president made clear that the United States is seeking broad support for a new U.N. resolution, while acknowledging that complete agreement on the issue did not yet exist. "Do we have unanimity in the international community? Not yet," said President Obama. "That is something we have to work on. We think that we are in a much stronger position to get robust sanctions now than we were a year ago, prior to us initiating our strategy." The United States has been working to obtain crucial support from China and Russia for a Security Council resolution. Beijing and Moscow have veto power in the council. But efforts at the United Nations come amid increased concern in the U.S. Congress that Iran might be speeding up efforts to develop a nuclear weapons capability. 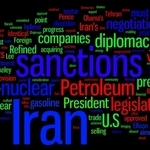 Later this month, House of Representatives and Senate conferees are expected to consider versions of the Iran Refined Petroleum Sanctions Act that both chambers have approved. The measure would penalize foreign companies that help Iran import gasoline and other refined petroleum products by denying them access to U.S. markets. Appearing this week on NBC television's Meet the Press program, Independent Democratic Senator Joseph Lieberman called for quick action, describing new sanctions as a "last chance" for Iran. The Hill newspaper quoted unidentified sources as saying the White House has quietly asked lawmakers not to move quickly to produce a single sanctions bill that would go to the president, who could sign or veto it. Bruce MacDonald with the United States Institute of Peace says a delay would help by not tying the administration's hands when it comes to negotiating with Tehran. "Having worked in Congress for a long time, I fully recognize that Congress should maintain all its prerogatives," said Bruce MacDonald. "But I would hope that they might give the Obama administration a little bit more of a chance, especially now when it looks like there is some movement on the part of China and Russia." MacDonald says reaching an agreement at the United Nations to achieve President Obama's timeline will not be easy, but it should not be ruled out. Where China is concerned, he points to indications from Beijing that it recognizes that something other than simply pure diplomacy might be needed with Iran. Iran has dismissed the threat of tougher sanctions, saying that any such step would only strengthen its determination to move ahead with its nuclear program, a remark Iran's chief nuclear negotiator made during a visit to Beijing. White House press secretary Robert Gibbs has avoided characterizing congressional contacts as an effort to slow down an Iran sanctions bill. Briefing reporters on Monday, Gibbs said only that this is a "critical time period" with U.S. allies at the United Nations. He reiterated the president's belief that a sanctions resolution would be acted on by the Security Council in the next few months.